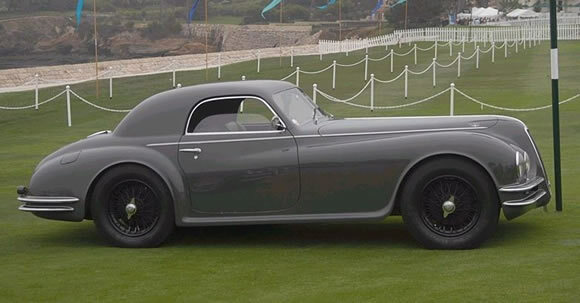 The Alfa Romeo 6C 2500 was first built in the 1930's and yet looking at this 1945 model my first thought was it could be a modern car. Beautiful lines and colour combine to give it a 'new' ultra modern look. Alfa Romeo really build beautiful cars but they hit it out of the park with the 1945 6C 2500. 6C refers to the straight 6 under the bonnet and the 2500 is the cc size. Capable of producing up to 110HP the car accelerated well and did very well in racing. Alfa Romeo worked with a lot of different coachbuilders to produce some stunning 6C models. Read more about the 6C here. It is a long and interesting history of beautiful motoring.